Yesterday was another day of rest from walking. When I returned from my early stroll with the boys I was immediately reaching for the painkillers. I am beginning to think that the trek around the Three Peaks last week may have done some permanent damage and if it continues to give this much pain I will be seeking out a Doctor soon. 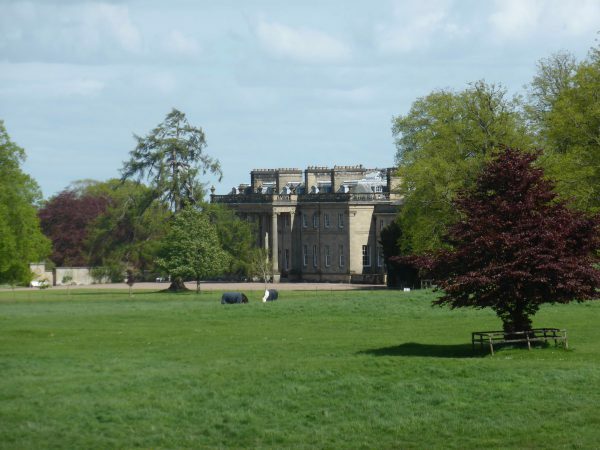 Lynnie took a very interesting tour of Paxton House whilst I settled down in the awning to do a days work. It was a productive day, but now I am itching to do some easy walking. I start to get a bit twitchy if I go too many days without a decent walk and part of the fun of travelling the way we do is the joy of visiting new places. 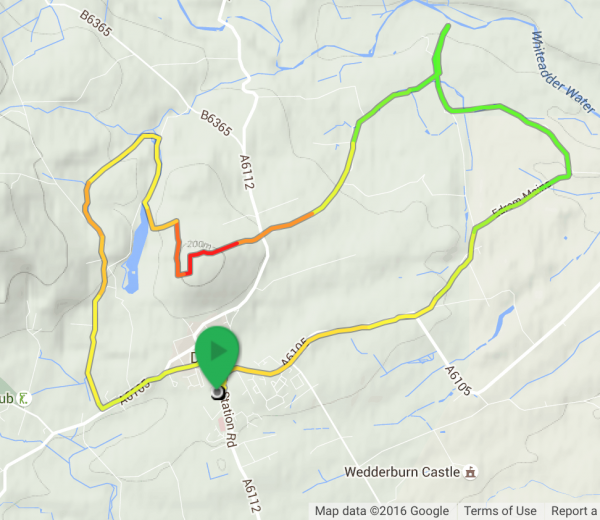 I describe a walk to Lynnie that involves passing a stately home, a monument, a hill fort and castle plus a river called Whiteadder Water, with a guarantee of no serious hills. She is immediately sold on the idea. 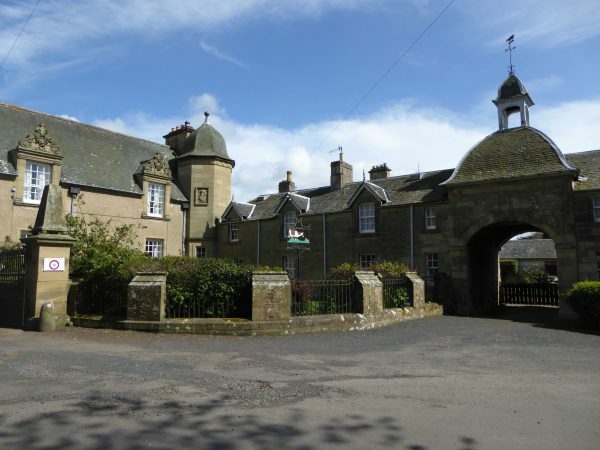 The starting point for our walk is Duns and we find ample car parking besides the towns well kept public park. We leave the town in an easterly direction along the pavement besides the A6105. After a while the pavement ends but there is a wide grass verge and it is a straight road so it is not hazardous. When the road bends to the right we carry on along a minor road heading towards the West Lodge of Manderston House. 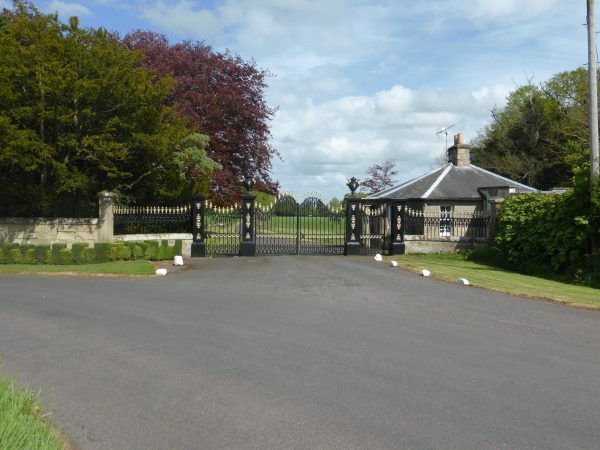 The estate has a fine set of gates, which we admire before heading on. Research on the internet also tells me the house featured in a TV programme called the Edwardian Country House, this means nothing to me because I do not watch TV, but it might interest others. If we did not have the dogs with us I would be tempted to do a tour, not least because apparently it contains the world’s largest collection of Huntley and Palmer biscuit tins, dating back to 1868. Following the road we soon reach the hamlet of Buxley, there are fine buildings here too. At a road junction we keep right and pass Manderston Mains before turning left at the next junction to head towards Edrom Mains. We pass Manderston Mill with its fine barns ripe for conversion. After passing the monument we walk down to Whiteadder Water, for no other reason than I like the name of the river and the boys could do with a drink. With refreshed dogs we walk back past the monument and take the lane on our right that leads us by Ladywell and eventually to the A6112. This lane did not have a name, but I think it could be called litter lane, someone hereabouts has a particular taste for Philadelphia Dips and has chosen to discard the packaging at the roadside. There were upwards of fifty of these packs over a three quarter of a mile stretch. I have noticed that you can tell you are in Scotland because of the prevalence of Irn-bru instead of Monster Energy cans littering the hedgerows. I would like to catch the culprits, but it might result in Taggart saying “Theres bin a mudda”. At the main road we cross and walk up towards the hill fort on Duns Law. This is an Iron Age fort which was also used by Romans and Covenanters. 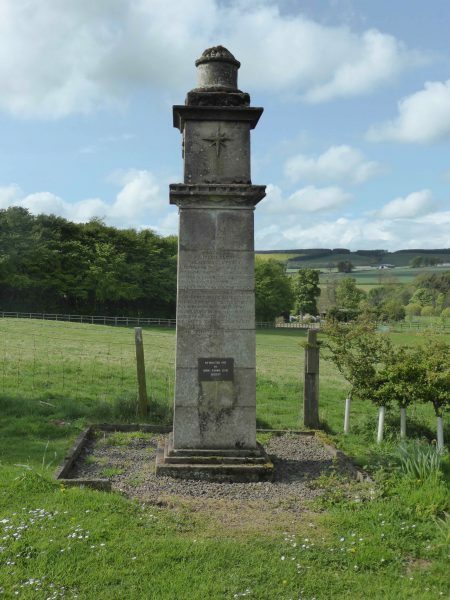 I have not previously come across the Covenanters but apparently they were a Scottish Presbyterian movement that played an important part in the history of Scotland during the 17th century. Today the hill fort is inhabited by bears who are keeping a wary eye on Crosby and Dexter so we decide to avoid direct confrontation and skirt the edge of the field. However Lynnie braves the bears to look at the stone marking the spot where the Covenanters raised their standard in 1639. We leave the hill on a footpath heading down towards Duns Castle, but at a junction of paths turn right away from the Castle to walk along the edge of the woodland overlooking a field and Hen Poo (a man-made loch). 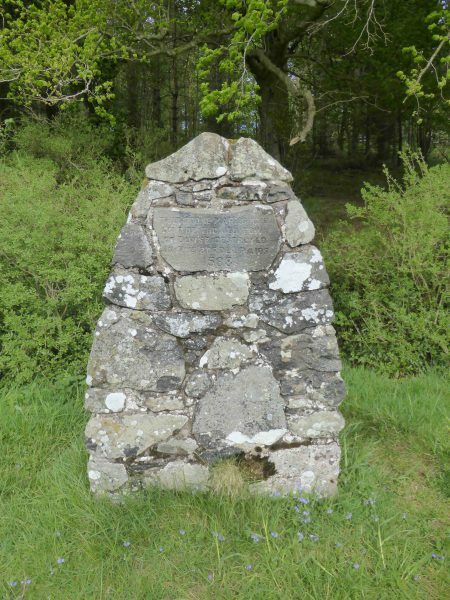 A few hundred yards along there is a stone just off the path with an inscription reading “This stone marks the site of the old town of Dunse destroyed in the border raids 1588”. We carry on and when the opportunity arrives head down to walk besides the loch and then into Castle Woods. There are a myriad of paths here but we pass another small loch and then turn left to follow a stream (or burn as they are known in these parts) which eventually meets with a track heading back towards Duns. 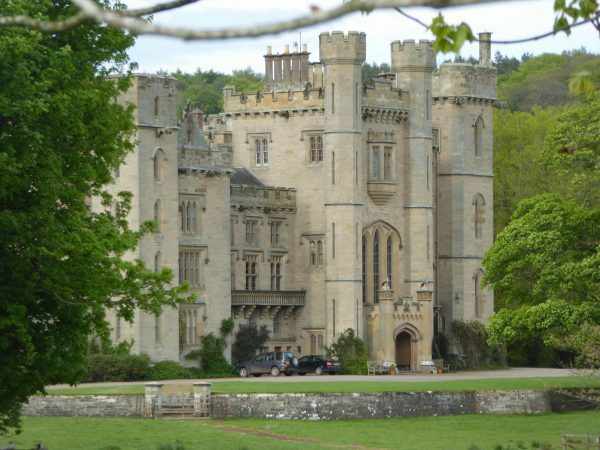 This track passes Duns Castle, a fine looking building, apparently the oldest part of which, the Norman Keep or Pele Tower, dates from 1320. On reaching the A6105 we turn left and walk back into Duns. This is an interesting town with a lot of fine buildings. It has the air of a town that has seen better days and needs a bit of investment in the local economy to return it to its former glory.. 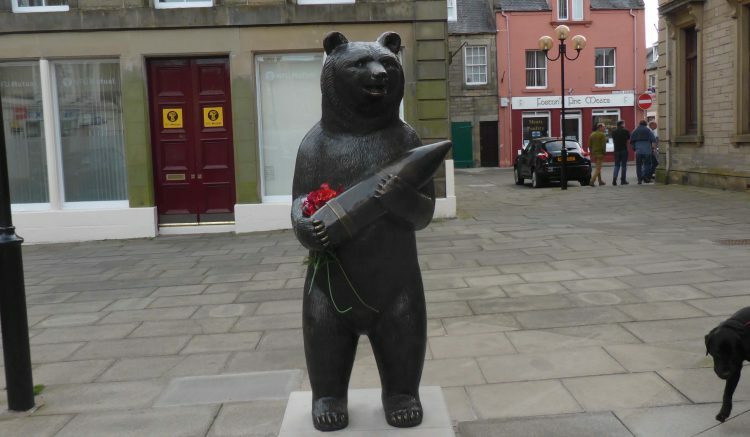 In the middle of the town there is a statue of a Bear carrying a bomb. This is a life-sized statue of Wojtek the bear, unveiled this April, he saw action in World War II. He was known as the “Soldier Bear” and was adopted by Polish troops in the Middle East in 1943 he helped carry ammunition. After the war, he lived in Hutton in Berwickshire before ending his days at Edinburgh Zoo. 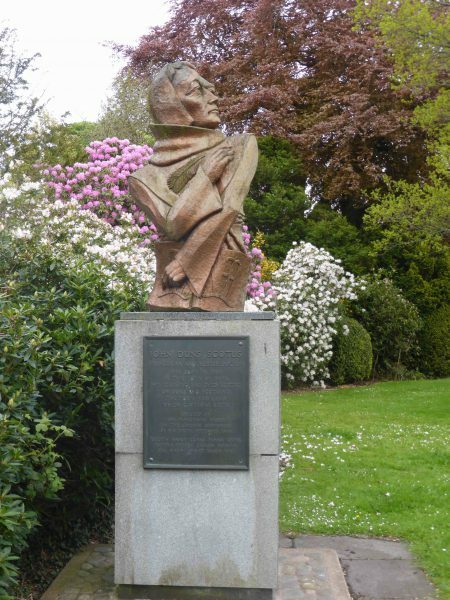 The new statue has been gifted to the people of Duns by its twin town of Zagan in Poland. After wandering around Duns we head back through the park. Two monuments catch my eye , the first a statue of John Duns Scotis, the inscription says he was a “Franciscan and Subtle Doctor born in 1266 in the town of Duns. 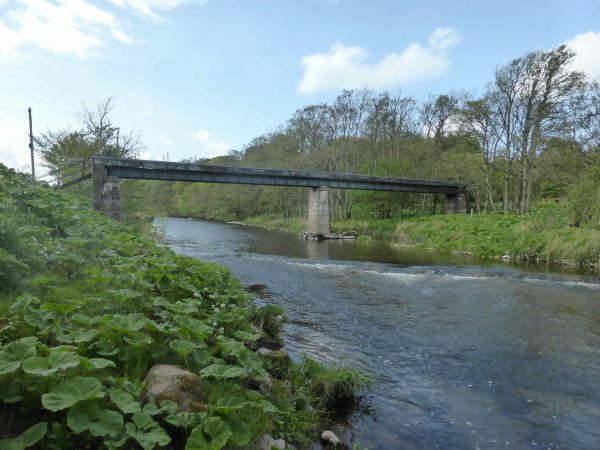 His learning has shed lustre on Duns and Scotland the Town and Land which gave hime birth”. I like the idea of a Subtle Doctor, but would definitely not want to come across an unsubtle one! The other is the Polish War Memorial. 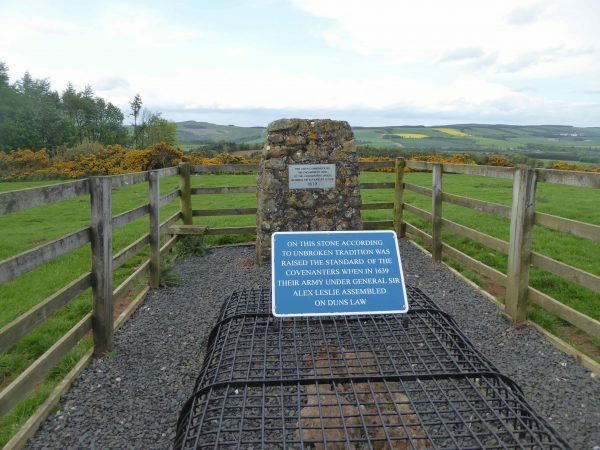 During World War II, the Scottish Borders were home to Polish soldiers who came here to form new regiments prior to returning south to go the front in Europe. Duns, and the surrounding area, was home to the First and Second Armoured Regiments of the Polish Army. 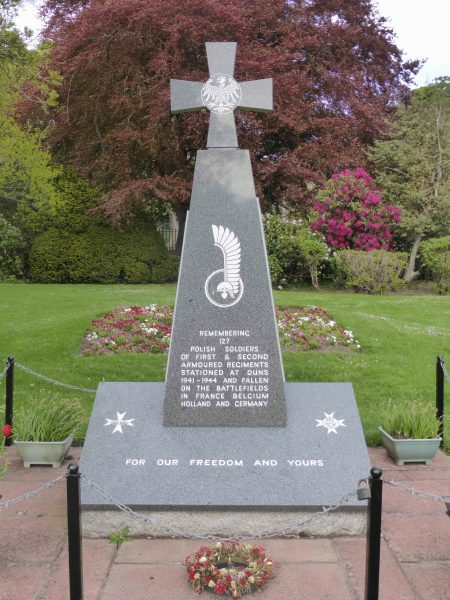 The monument is a tribute to the 127 men of these regiments who died in the conflict. It is late afternoon by the time we are back at the car so we decide to return to Paxton House, my Suunto Traverse reads almost ten miles. Further than I had originally planned but mostly level and easy going so my knee has not been too painful, although we will aim for a shorter stroll tomorrow.